Italy's Chaoswave has been treading the heavy metal road since 2003. Previously, 2005's 'The White Noise Within' garnered some interest, but made little impact. In 2007 they began pitching to record companies a four song EP produced by Danish producer Jacob Hansen (Mastodon, Destruction) in advance of hitting the studio in December. This initiative brought some recognition because Andy LaRocque, guitarist for King Diamond handled the knobs and former Nevermore/Testament guitarist Steve Smyth guests on three guitar solos. The result is 'Dead Eye Dreaming,' and my first experience with Chaoswave. It didn't start out as a good one. My first impressions of 'Dead Eye Dreaming' were negative: is there nothing interesting here? and, this is going to be a tedious listen. Honestly, I barely made it through the first five tracks. Even with Steve Smyth showing up on two songs in this early progession, he could only save one, 'Fork Tongues and Foul Times,' a fast-paced thrashy prog number with an equally impressive bass line. Needless to say, I was getting both bored and irritated. But I soldiered on and I'm glad I did. Though the early portion of 'Dead Eye Dreaming' left a dull drone in my ears, the music improved impressively in the middle of this work. From 'Blind Eye Focus' to 'Two Shadows,' Chaoswave demonstrated better song craftsmanship living up to their modern progressive metal appellation. 'Blind Eye Focus' delivered a more vibrant mix of prog with melodic heavy metal; excellent vocal arrangements here. 'Dead Eye Dream' and 'Rise' tilt more towards melodic, and seriously heavy, power metal with subtle prog edges. The former has some solid and creative keyboard work. The latter delivers a solid melodic progression complimented by some sound fret work by Smyth. For me, the centerpiece of the work is the masterful, 'Two Shadows.' It's moody subversive start leads to an epic melodic combination of prog and power metal capped with a brilliant guitar solo. From here, the album rounds out with some generic modern heavy power/prog metal much like the earlier stuff; not exactly the most fitting conclusion. 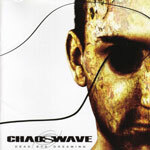 Chaoswave's 'Dead Eye Dreaming' is an interesting, but not overly impressive, mixture of modern power/prog metal. Much of this is due to the inherent sameness running throughout this work, too much heaviness without focus. Yet, the disc is spared complete redundancy by such excellent pieces as 'Another Lie To Live In Vain,' 'Blind Eye Focus' or 'Two Shadows.' This is Chaoswave's future.